… the dazzling kneelers he designed in 1993 to surround Henry Moore’s circular altar at St Stephen Walbrook are a vibrant and stunning addition to the church. 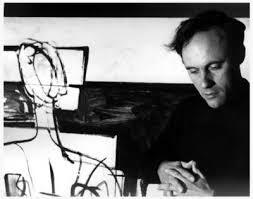 Patrick Heron (1920-1999) was one of Britain’s foremost abstract painters. He was also a writer and designer, based in St. Ives, Cornwall. His work is recognised for its bold use of colour and light which redefined British abstract art in the 1960’s. Initially inspired by the French painters Henri Matisse and Georges Braque, he turned to abstraction in his mid-30s, under the influence of Abstract Expressionism, in particular the Colour Field Painting style popularized by Mark Rothko and Barnett Newman. His work is noted for its saturated colour and – despite being unmistakeably abstract – the essential naturalism of its forms. These qualities are apparent in the dazzling kneelers he designed in 1993 to surround Henry Moore’s circular altar at St Stephen Walbrook. The kneelers were made by Tapisserie, specialists in fine hand painted needlework.